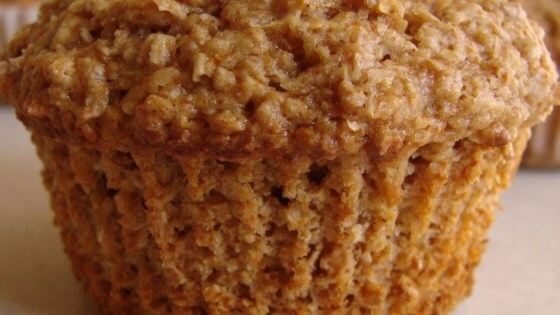 "This is not OATMEAL, but oat BRAN muffins. I have made these for about five years now, and I really love them. They are great made with cinnamon or cranberry applesauce, as well as plain applesauce. My daughter loves them and I hope you will enjoy them, too!" Preheat oven to 400 degrees F (205 degrees C). Line or grease 12 muffin cups. Blend together brown sugar, oat bran, flour, baking powder, soda, and salt. Add eggs, chilled applesauce, and vegetable oil. Mix until well-blended. Spoon batter into muffin cups. Let stand 10 minutes.